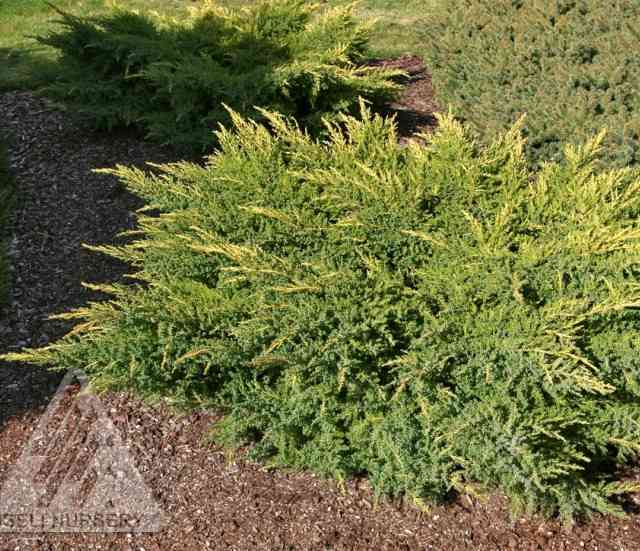 This low, spreading juniper is especially appealing because it has unique two toned foliage. The new, bright, golden-yellow growth of 'Daub's Frosted points in all directions above the bluish-green, feathery, interior foliage. It is the perfect selection for a sunny, well-drained bank or other challenging site where a reliable bit of colour is needed. The dark purple berries lighten as they mature. Juniper 'Daub's Frosted' is very easy to grow in average well drained soil in full sun to partial sun. Junipers do not like clay soil so amending with compost is necessary to improve the drainage where clay is present. In sandy soils compost will improve the moisture holding capacity of the soil. Be sure to leave enough space for the juniper to spread naturally.